The 20th Annual Bridge School Benefit (BSB) concert was held Saturday, Oct. 21st and Sunday, Oct. 22nd, 2006. Unfortunately, I was unable to attend. 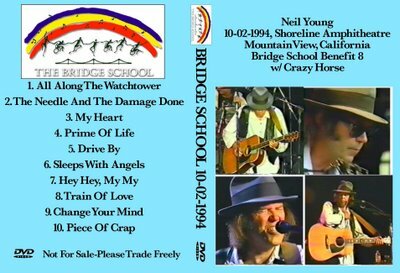 However, I have been watching a recently “acquired” DVD of the 8th BSB (1994) performance by Neil Young & Crazy Horse in honor of the event. Now, for those who are unaware of the annual BSB event, it attracts some major artists, almost all of whom perform acoustically...an "unplugged" event, for the most part. That can be a very interesting aspect of the event, especially for certain artists. This year, for example, Trent Reznor (of Nine Inch Nails fame) performed an acoustic set (Haahnster Note: I'd love to hear it if you have it...I have lots to trade). This brings us back to the 1994 BSB. Neil Young didn't do much touring in 1994. He did, however, release what many consider to be his last truly excellent album, Sleeps With Angels, on August 6th of that year. Fast forward to October 1st and 2nd, and Neil has decided to bring out Crazy Horse for an ultra-rare, "unplugged" appearance with that line-up. Best of all, he features primarily the new material, which ranges from highly interesting to overwhelmingly amazing in this format. You wouldn't believe what they do with the extended guitar workout, "Change Your Mind"...It's a killer set! Gawd ... I love "Change Your Mind." And everything on Sleeps with Angels, actually. Oh ... did I tell you I went to the 1999 BSB? A sleeper comment from a sleeping angel. Beth. Not me. You know what I mean. Although I haven't always been a die hard fan of Neil, I love that he does the benefit. He and his wife are good people no question. 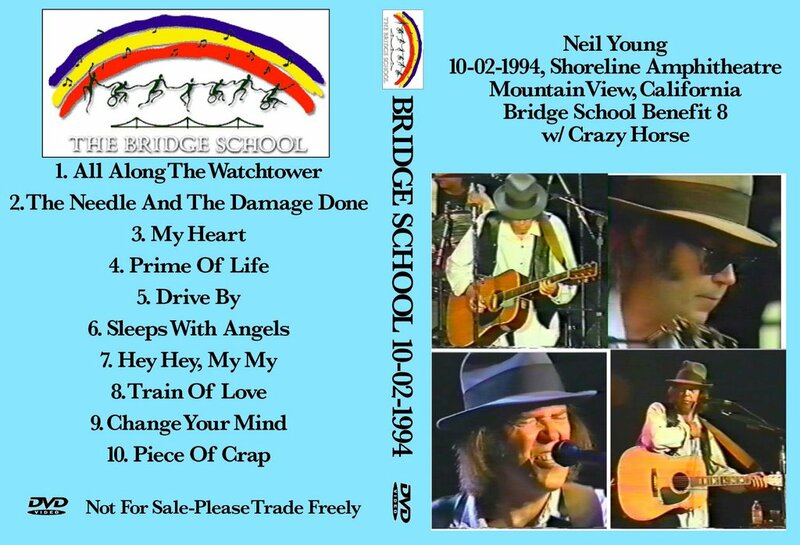 Went to The Bridge School Benefit several times when we lived in the Bay Area. The last year I was there I was working on the school campus and was able to get great seats as they sold to school staff first. Great shows, great cause. Where In Holy F*ck Is...?